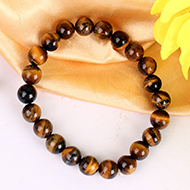 The Tiger's Eye Gemstones is renowned as a chatoyant gemstone. It displays a unique property of optics in which it looks like a cat's eye glowing in the dark. It's usually found in metamorphic rocks, and is a derivative of silica (silicon dioxide) crystals. The stone can be red or dark yellow, depending on its source and the way it has been cut. The stone is also polished, and when finally prepared, has a very unique sheen that can be both seen and felt. 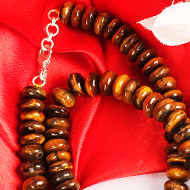 Africa, notably South Africa and Asia are the two biggest producers of Tiger's Eye Gemstones. 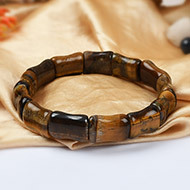 Tigers Eye gemstones have been used throughout history in most parts of Africa as the stone of prosperity and fortune. Natives believed the stone protects one’s personal resources against black energies and other envious fellows. 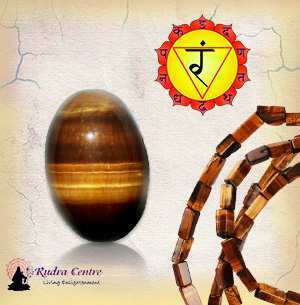 Today, Tiger's Eye Gemstone is used for making ornaments and jewellery. The stone can be studded into bracelets, pendants, beads and rings. The stone is extensively found in East Asia, India, Burma, Korea, Australia, Brazil and parts of Africa including Namibia. By wearing a Ruby, one attracts name, fame and prosperity, and imbibe leadership qualities. It is designated as the King of gemstones due to its association with Sun. Ruby Stone is a protective stone that offers preserved health and invulnerability to its wearer. 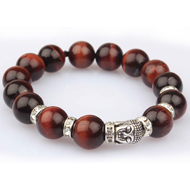 O Wearing the Tiger's Eye Gemstone apparently helps improve values of self-esteem and self-dignity. O It's also highly related to qualities of patience and tolerance, and other spiritual values. O This stone, when worn in contact with the skin, helps spread joy and raises the importance of peace within, and also improves the wearer's health. O It promotes courage and self-integration. Wearing a combination of Gemstone and Rudraksha is the best way to make the most of it. Rudraksha Ratna Science Therapy® (RRST®) devised by Neeta Singhal makes the use of both Ruby Gemstone and Rudraksha beads. It is a holistic healing therapy that uses the curative and healing properties of Rudraksha and Gemstones to balance and energize chakras. In RRST we deal only with natural and un-treated gemstones. 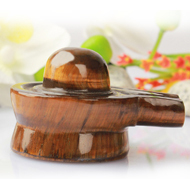 The reason Rudraksha Ratna Science Therapy is widely acclaimed by many is that it works on chakras, the very basis of life and is a holistic therapy that heals from deep within with absolutely no side effects. In RRST setting of a gemstone, as a ring or as a pendent, the bhasm made of the planetary herb is kept inside one tube and the metal that improves the planetary effects, is kept in another tube. In case of Tigers Eye, Ark Bhasm and metal Tin are used to attract the cosmic power of Sun. The gemstone is then energized with its precise seed mantra on a specific day to empower it to eliminate all the malefic effects of the planet and reinforce its beneficial effects. Thus the gemstone becomes a powerful talisman suitable to be worn by any person irrespective of his birth chart. During consultation, the blocked chakras that are causing the mental, emotional and physical issues are identified and limiting beliefs are addressed. Chakras become imbalanced when your thoughts and attitudes tend towards fears and negativity when facing challenging situations in life. Blocked Chakras manifest emotional disorders and physical ailments. It is only after blocked Chakras are balanced and activated that you can transform your life of suffering, obstacles, and confusions into love, success, and happiness. As per the chakra status and concerns of the client, a suitable combination of Gemstone and Rudraksha bead is recommended. As per the cosmic colour they emit, the gemstones work on specific chakras. 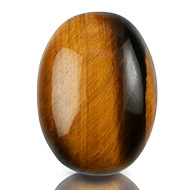 So Tigers Eye works on Manipur Chakra and the RRST Consultant identifies the correct finger position for drawing maximum energy from the stone. Rudraksha and Gems are powerful agents of energy and work on releasing the negative energy stored in the form of stress in the blocked chakras, thereby activating them and tuning them to their natural state. ‘Manipura’ comes from the Sanskrit roots ‘Mani’ meaning ‘jewel’ and ‘Pura’ meaning ‘City’. It is the city of jewel-like qualities such as self-confidence, bliss, self-assurance, knowledge, wisdom and the ability to take the right decisions. Also it is the Chakra that accommodates prana (life force) which is supplied to the other areas of the body. In this Chakra, the native attracts energy from the environment around them and the people they come in touch with. With this Chakra, we attract positive or negative vibes from others. The ruling sense of this Chakra is Mind. Therefore it is important to keep this Chakra balanced and harmonious. With a balanced Manipura, one controls and masters their mind and sense impressions. All the fantasies and illusion are checked and eliminated. However, when this Chakra is blocked, you lose vigour and give away your powers to others, thinking that the relationship is more important. Therefore it is essential to keep this Chakra open which helps you retain your powers and energies. Tigers Eye Gemstone can be cleaned using hot soapy water, rinse thoroughly afterwards as detergents can cause dermatitis and allergic reactions. Avoid enzyme cleaners. Brush with an old toothbrush to remove dirt and grease. Avoid cleaning agents containing chlorine as they may have a detrimental effect. It can be worn on Sunday in the morning after bath. If need be, one may additionally chant the seed mantra “RAM” 108 times before wearing.